Whitless: Sulky Errol is no fun, hiding under his pink shirt of lonliness. Sulky Errol is kind of scary too. Especially with that hideous pink shirt. I just can’t stop fixating on it! I wonder if the magnitude of his sulkiness is measured by how much laundry he hides under. Or the ugliness of the laundry he hides under. I hate pink if it wasn’t too apparent J. Poor Errol. He just wants to do all the things. With all the people. I’m amazed actually that Errol has held back from appearing. It must be killing him not to interject. I’m sure he hates my non-tangents and my inability to scare people with happiness. 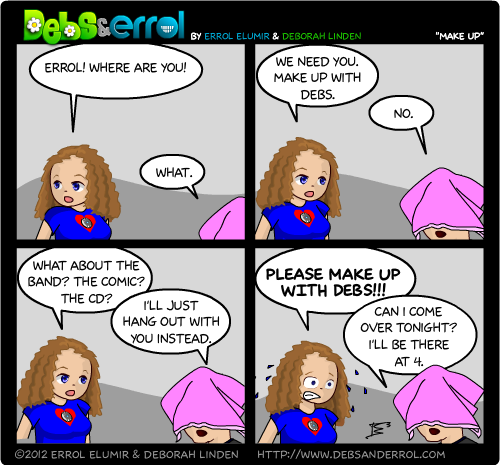 Hopefully he and Debs will make up, because their songs are awesome and the world should not be deprived of such awesomeness J. Plus…Errol drinks all my juice. When Mommy and Daddy are fighting, it makes me feel funny. I laughed at, “Can I come over tonight? I’ll be there at 4,” because, dude, been there! @Victoria, I was going to mention in the blurb that you learn very quickly with Errol that there really isn’t any choice in hanging out with him. Once you are chosen, there’s no escaping :P. And yes, he has come to my place too at 10:30 at night ready and raring to go on projects. @Victoria, I don’t like the picture of me you’re painting, Vix. And how do I survive on little sleep? I’m not… actually. I must inFAWM you that the pink shirt is truly hideous (at least in its comic incarnation).